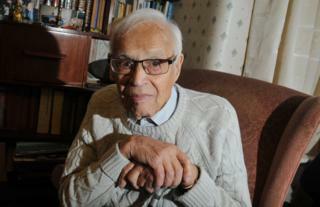 A 97-year-old World War Two veteran has vowed to bounce back from a "horrific" robbery on his own doorstep. Harry Melling was shoved to the floor and had his wallet stolen in the attack in Newtown, Wigan on 12 October. The widower, who served on submarines during the war, said that while the raid had "unsettled" and "disturbed" him he was "certainly not afraid now". Greater Manchester Police said the raid, which happened at 22:00 BST, was "horrific" and are seeking witnesses. The suspect is described as 5ft 8in, of medium build and wore dark clothing. Mr Melling, who is being supported by his extended family, said: "It was a shock. It unsettled me for quite a period of time and it has disturbed me. "I had a friend in the house. We had been having a drink and a chat and he left. I remember this fellow at the door and after that it was vague. "However, although I would say that I was afraid at the time, I'm certainly not afraid now. I find that a bit remarkable but it has affected me." Mr Melling, a former warden at St Mark's Church in Newtown, added: "At 97, you have supposedly seen it all but this was definitely a new thing and I have had to try to overcome it. "I wouldn't say I am brave, probably more stubborn."